InfoSec Handlers Diary Blog - Mr Jones wants you to appear in court! 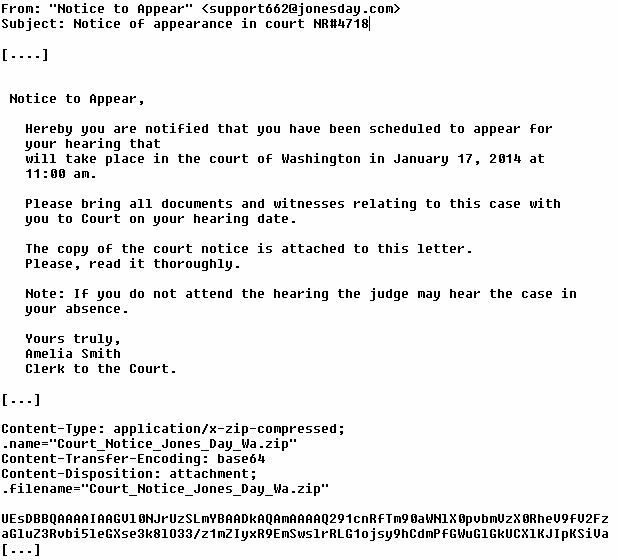 SANS ISC: InfoSec Handlers Diary Blog - Mr Jones wants you to appear in court! Mr Jones wants you to appear in court! The C&C of the original Costco sample was at 89.32.145.12:443 and 188.40.130.18:8080. A supplemental binary was pulled from 50.31.146.101:8080. If you have additional information on this scam or yesterday's Costco/Walmart version, please share in the comments below. Thanks to Francis Trudeau of Emerging Threats for help with the analysis and gathering the C&C traffic.